Thank you all for your support toward becoming a charter county. 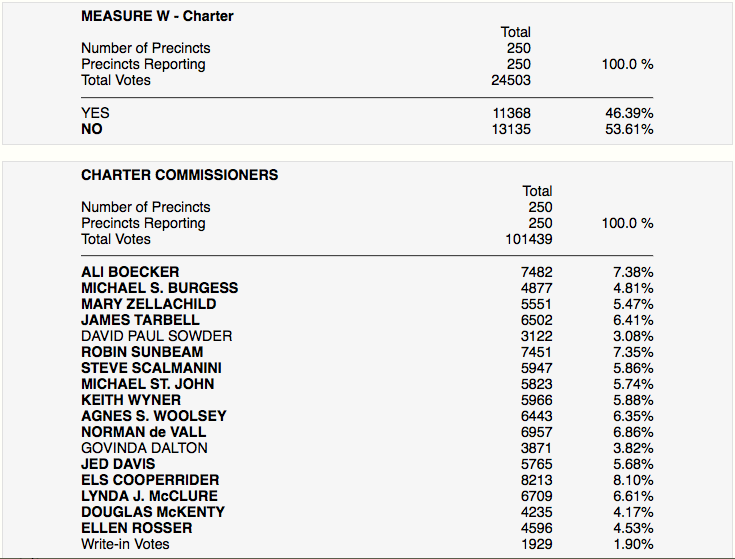 The final tally of votes in Mendocino County has just been posted. Measure W got over 46% of the vote, a clear indication that increasing numbers of Mendonesians are determined to participate in the grassroots revolution and have a voice in how we're governed! Change is erupting worldwide, with upheavals happening right now on the national, international and local levels. People are waking up to realize that governments and corporations are in bed together enacting policies that adversely affect our lives and serve only the rich. Real positive change happens only when a grassroots groundswell of citizens decides that things need to change and they empower each other to take action together. Real change never takes place from the top down or in the living rooms of wealthy industrialists. It always occurs from the bottom up when thousands of Mendonesians say loud and clear, enough is enough and then become involved in the fight for justice. In the best of worlds, this kind of action can also take place at the ballot box. The campaign for Measure W was extraordinary in that some 150 volunteers donated their time collecting signatures, holding Town Halls, distributing information, raising and donating money and urging their fellow citizens into action. With their help we waged a memorable campaign and gave it our best. 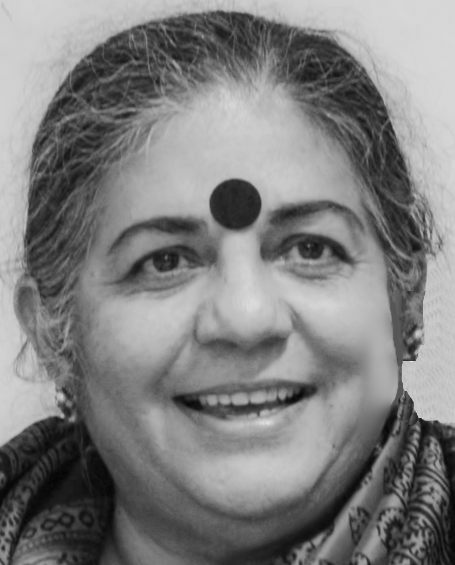 We are also very grateful for the support given at the beginning of the campaign by Dr. Vandana Shiva, who helped us raise $8000 towards becoming a charter county! Again, thank you for voting YES on Measure W. We really appreciated your support! Why Become a Charter County? Why does Mendocino County want to join the fourteen other California counties that are Charter counties? Because Charter counties empower participatory democracy by engaging the people to make the laws that custom fit their county. It's called Home Rule and the charter laws passed by a majority of the voters in an election are the equivalent of the laws passed by the California legislature. California became a Home Rule state in 1911 and Los Angeles was the first Home Rule county in the USA in 1913. After the Charter Commissioners are elected, they will draft a county charter to be ratified by the voters in a future election. The following are a taste of what the future charter might provide for us. The Charter Commissioners will gather input from every part of the county to make the charter as democratic as possible. At this stage, the charter has not yet been written. For example, the environmental ordinances—no fracking, no GMO agriculture within the county, no nuclear power plants—could be given added power by being made Charter law. Protect the people of Mendocino County by empowering them with a Charter. Another example. The bees that pollinate the farmers' crops are being devastated by neonicotinoid pesticides. Charter law could prohibit the neonicotinoids and save the bees—and the Mendocino agricultural economy. The Charter might require that Mendocino County's money be ethically invested prohibiting investments in companies that support GMO foods or pay no income tax, exploit their workers, or felon banks. Mendocino County should only invest ethically. Under a Charter, laws could be passed regarding the Precautionary Principle, campaign contributions for County candidates, Instant Runoff Voting, regulating corporate campaign contributions, and public financing of elections. But these are a spattering of the potential issues for the charter commissioners to consider in Stage 2, after Measure W is approved by the voters on June 7th. All power to the people of Mendocino County! Vote YES! for Measure W, to form the Commission that will write the future Mendocino County Charter. Is a 2-stage process: First to elect Charter Commissioners by approving Measure W. Second, to draft a charter to be ratified by the voters in a future election. It will empower participatory democracy and will revitalize the electorate. The provisions of the charter will provide laws that are custom fitted to the unique needs of Mendocino County. The Charter Commission will gather input from the public in every area of the county for what would be the best custom fit for this county.